Thanks to those who commented on my first post about this game. 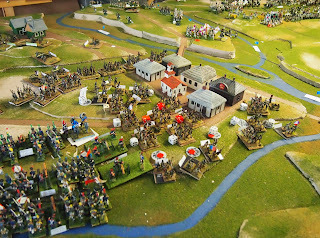 Your kind and encouraging comments are much appreciated by the players, members of the Nunawading Wargames Association (a wargames club based in Melbourne) whose game I have been kindly allowed to join as a player and observer. 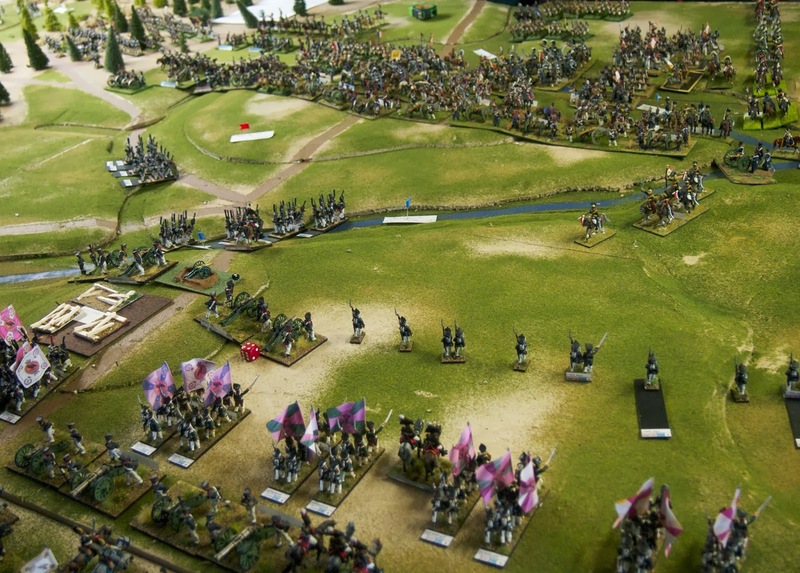 Each January the Napoleonics group from the NWA gather to hold a big, historical re-fight; this year’s game being based on Borodino. 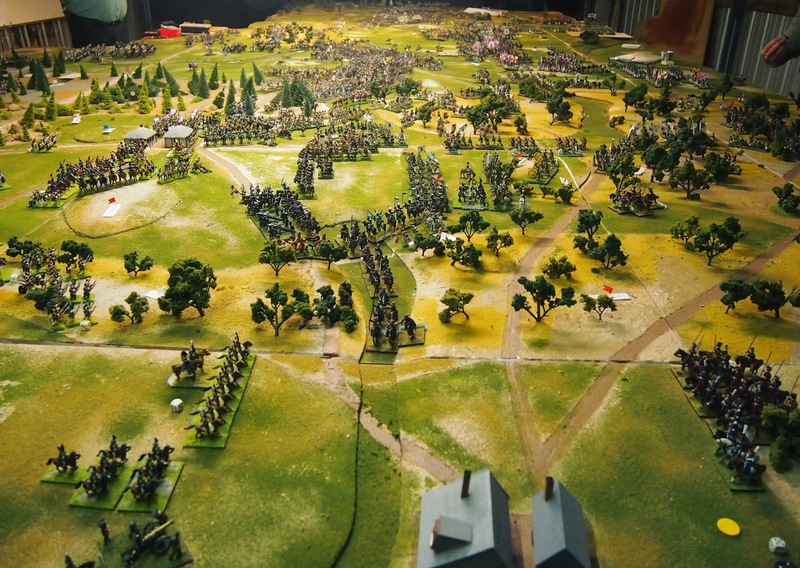 The game is being played on a 24’ x 14 ‘ table. There is a central table that is 24’ x 4’ around which are ‘layers’ of 8’ x 2’ tables. These latter are on casters so can be wheeled in and out as need for game play, over-view of the battle—and photos! 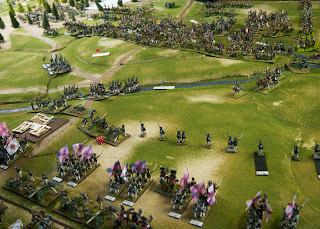 The game is being played using the club’s own Cold Steel rules, an Empire successor set. 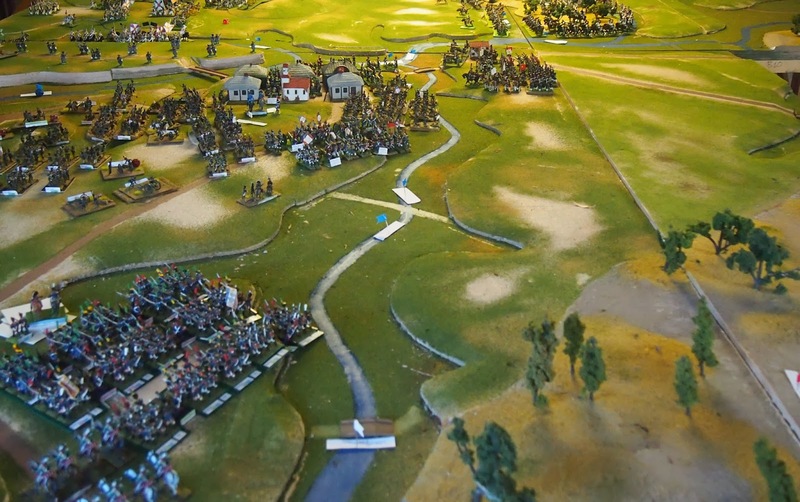 These are battalion/regiment/battery scale rules with a figure scale of 1:60, ground scale of 1:100 and each turn representing approximately 15 minutes of real time. 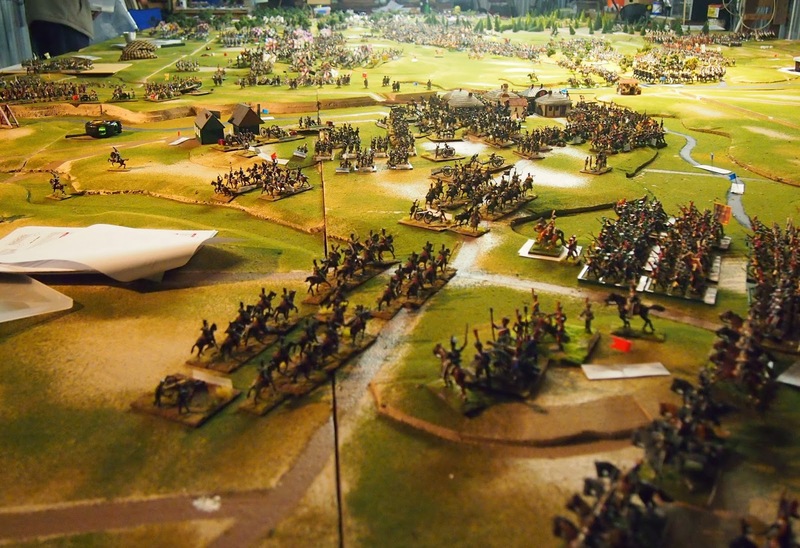 The game is being played using 1/72nd and 25/28 mm figures, all of which were painted by members of the club, most of them during the two-years of planning for the game. You’ll also find some photos of the game on Ben ‘Rosbif’s’ blog. At the end of the first full day of the game we are on schedule at the mid-point of the battle, the 11:45 turn. After capturing the flêches by 07:15, the French-Allied attack in the centre petered out. 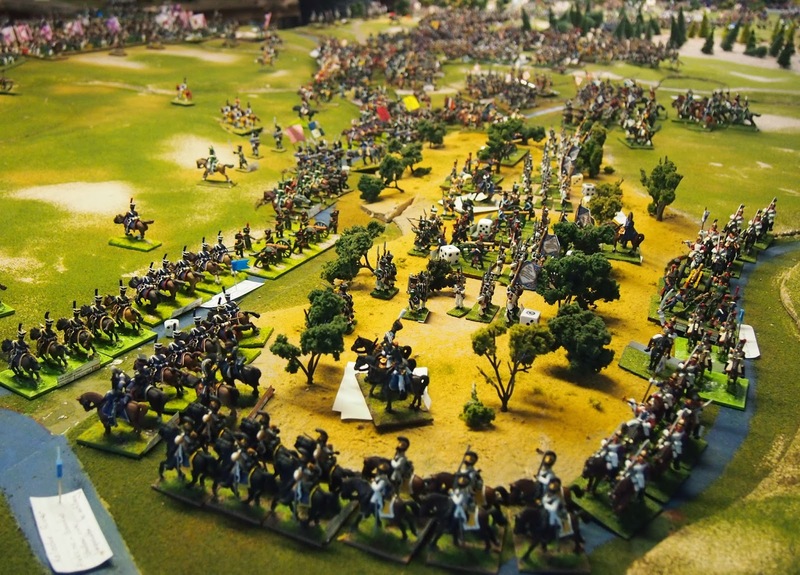 While Ney and I and II Reserve Cavalry Corps consolidated their position—with much ‘skulking’ in the dead ground—the lead elements of Davout’s I Corps moved into the Utitsa woods to assist Poniatowski’s V Corps in the attack there. 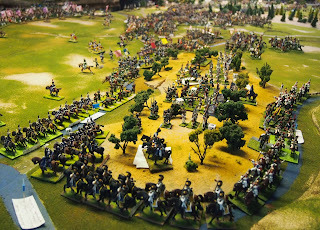 Although they did produce the largest cavalry mêlée of the game so far. In the north Eugène’s expanded IV Corps faced-off the Russians across the Kolocha until I, with “the bruiser” Broussier’s division was ordered to attack across the bridge to establish a bridgehead on the southern bank. 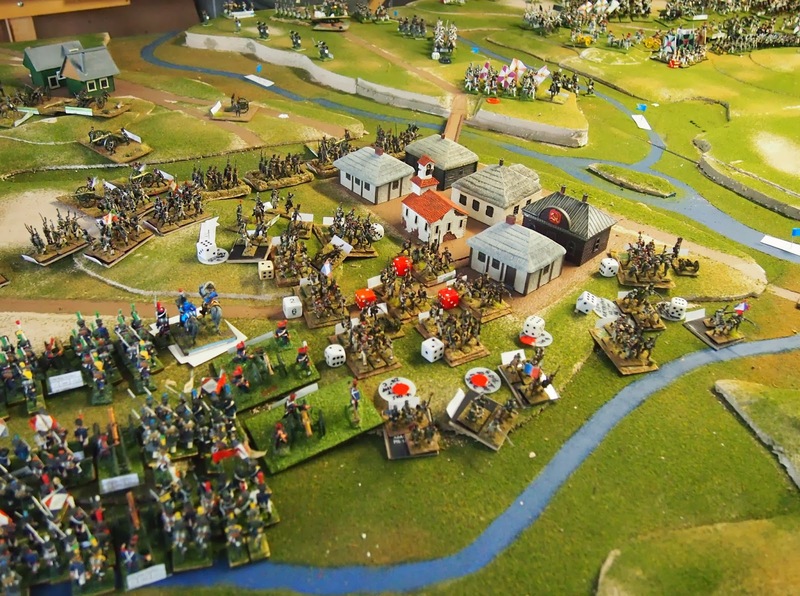 Unfortunately the Russians had anticipated the move and the division was put into retreat by a combined-arms attack from Tim’s Russians. 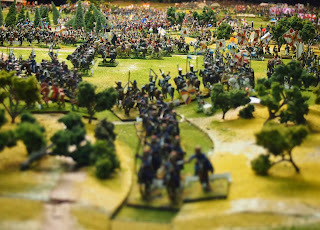 Fortunately they automatically rallied and are now ready to fight again! Below are a few over-view photos of the battlefield as it stands. 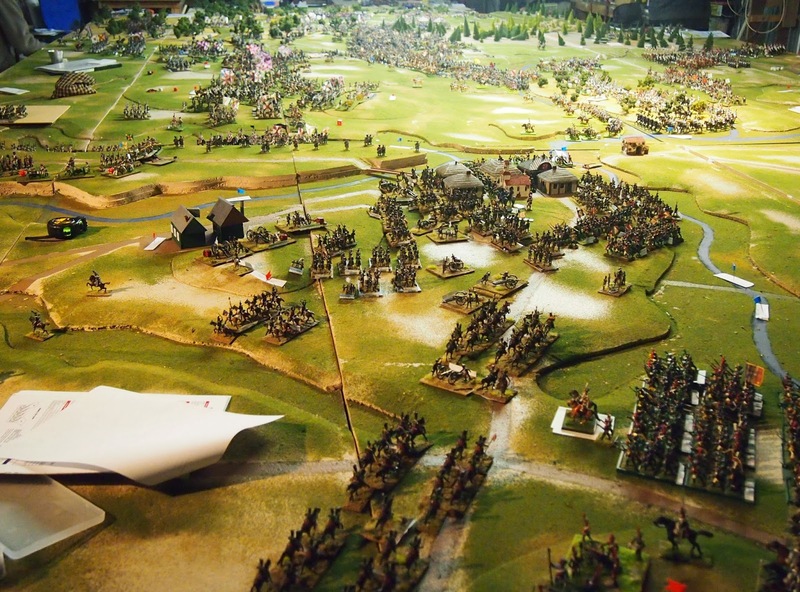 The ‘Borodino traffic-jam’, familiar to those who have played a game of this battle, is in evidence—such is the density of troops. From the south, Utitsa at centre-left. 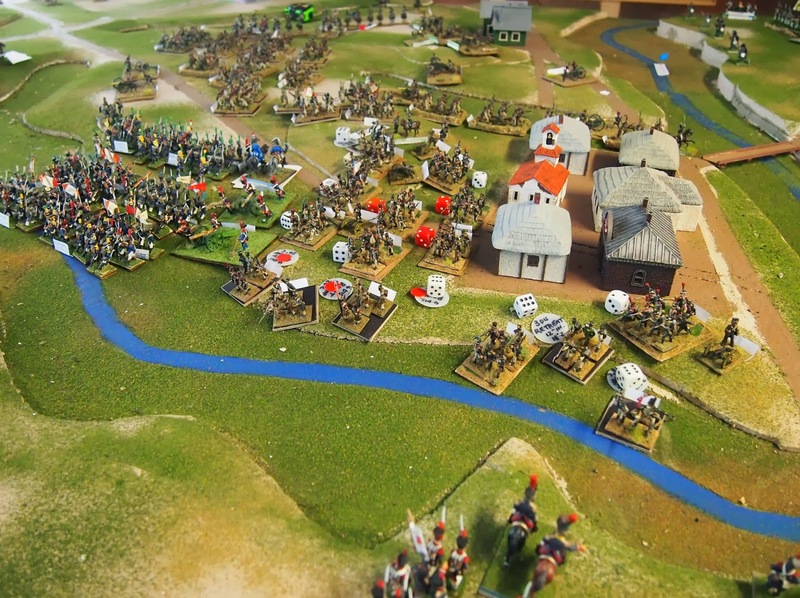 From the north, Borodino at right/centre-right. This looks incredible. Really enjoying these photos! 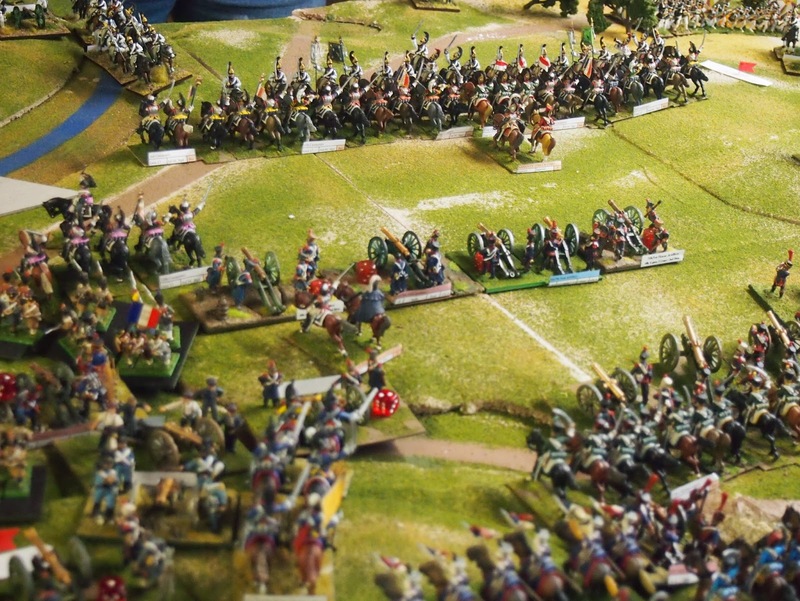 Interesting move to send Davout to help Poniatowski - a variation on Davout's flanking idea? 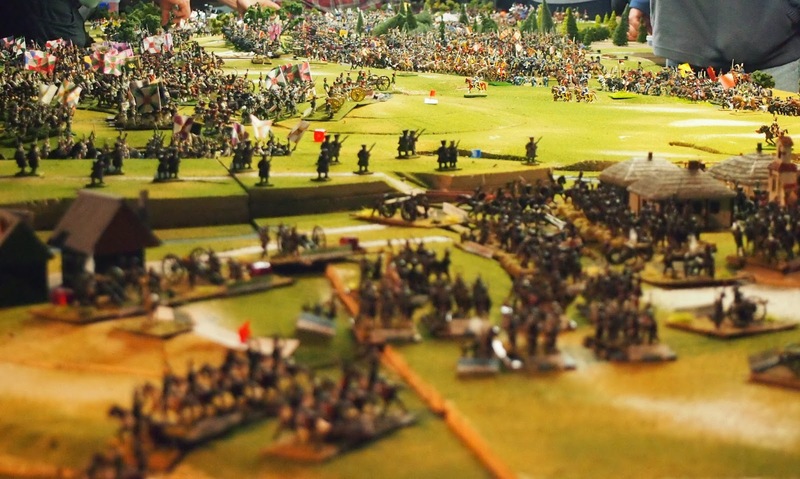 Very impressive and some great photos showing the scale and panorama of the battle. 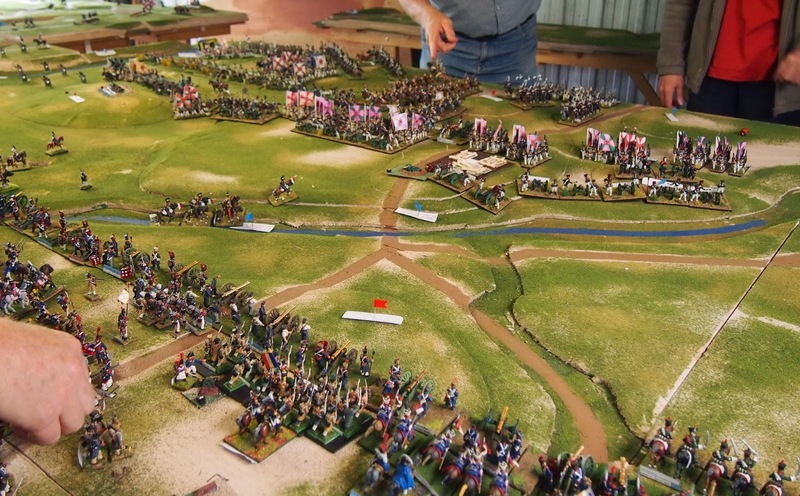 The 9 figure units on their movement trays look good and I'm sure the labels helped keep track of everything, but there does seem to be a lot of them and dice as well? • It sure is Ian. I'm most grateful that they have allowed a 'blow in' to be part of their big, annual event! • Pleased that you like the pics Andrew. As you know, they only capture a part of the real spectacle that is before the eyes. • Thanks Rodger. This is up there with the grand games that your group has staged. • Mark, the strengths of the units vary with the best estimates from the OBs, so infantry units range from 6 to about 12 figures. The dice all over the place (mainly white ones) mark unit disorders which come from terrain, retreats, being retreated through and adverse results from firing and the melee process. The other dice (usually red) indicate 'casualties' on batteries. Some marvelous and inspiring pictures there, James! That is EPIC. I'm sick with envy at not being there to see it in person. Keep posting pics please! Looks absolutely fantastic! Thanks for all the pictures! Good Lord man. That is fantastisch!